Some people prefer to face their problems head on, meaning they attack them fully without trying to come up with ways to escape to get around it. For some people it is better to come at the problem from different angles, and to take their time with it. 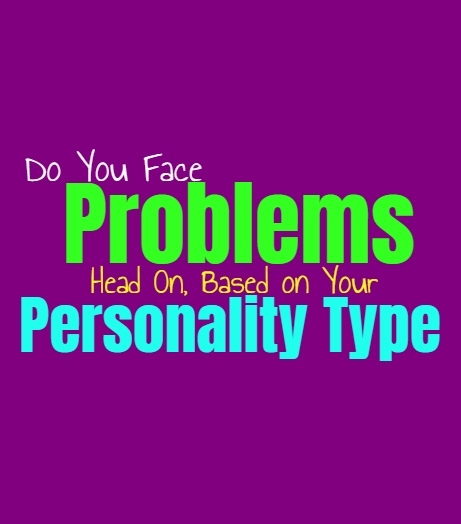 Here is how likely you are to face your problems head on, based on your personality type. INFJs often want to face their problems but they don’t like attacking them without taking the time to process what is going on. They want to be able to take care of these problems but they don’t always see solutions the way some others might. INFJs use their intuition in order to uncover the most likely outcomes, and this helps them to really face these problems. There are times when the INFJ might struggle to face certain problems head on though, especially if these things are more tied to their emotions. ENFJs do want to face their problems head on and usually they are capable of doing this. When it comes to juggle tasks and getting things done, ENFJs are truly perfectionists. They want to be sure that everything is taken care of and don’t like leaving anything unfinished. For them ensuring that they can handle taking on their problems without hesitating, is truly important. There are times when they do struggle though, when the problems they are facing are tied to their inner emotions and this can often hold them back. INFPs don’t really like feeling forced to face their problems directly, since they want to have time to process them. If the problems they are facing feel overwhelming or like an obligation, the INFP might not want to face them head on. They are more likely to analyze the problem and try to come at it from a unique approach. INFPs think outside of the box and don’t feel a strong need to always follow the rules, and so they don’t always face problems head on in the way others might expect. ENFPs don’t really like facing problems head on, especially ones which create discord around them. They don’t like having to deal with arguments or tension, and so sometimes ENFPs can try to avoid these things or these problems. If they are having a problem in their relationship they sometimes try to remain positive and only focus on the good, which really isn’t taking on the issues head on. ENFPs would rather try and be more creative in their problem solving approach, often coming at it from different sides. INTJs definitely know how to face problems directly, but they also like to analyze and take their time to plan out their attack. When it comes to problems arising the INTJ doesn’t run from them or try to avoid these issues, instead they take them on and work to solve them. They aren’t afraid of struggle or discord, instead INTJs often enjoy the opportunity to use their minds and their skills to improve the situation before them. They definitely are capable of facing problems head on, especially if there is a logical solution. ENTJs are most certainly capable of facing their problems head on, and are rarely afraid of doing so. They are naturally problem solvers, who believe in working towards the best and most logical solutions. When they are faced with a problem the ENTJ wants to analyze the situation and put together the smartest plan for overcoming whatever is holding them back. The only times ENTJs might not face a problem directly, is when it is based on emotions and does not have a logical answer. INTPs don’t really face problems head on, since they want to approach them from many different angles. For them it isn’t about being aggressive, but rather about being logical and smart. They want to be able to analyze the problem and find the smartest way to approach it in order to gain the results they want. INTPs often enjoy piecing together the information and for them problem solving is something which takes time to really analyze all of it. ENTPs are capable of facing problems head on, but they often prefer to think outside of the box. ENTPs don’t like just aggressively going towards their problems, instead they want to analyze and uncover more efficient ways of doing this. They are logical people who actually enjoy problem solving, since it gives them a chance to explore different ideas and different options in their lives. For the ENTP being able to consider different angles is actually something which can be rather fulfilling for them. ISTJs definitely face their problems head on and don’t like backing down from a challenge. When they have something they know they need to take care of they want to push themselves to get it done. ISTJs will not be afraid of navigating these problems and will do whatever it takes to get them settled properly. They are efficient people who believe in always being practical and being sure that they can handle their tasks and responsibilities. ESTJs definitely know how to face their problems head on, and often prefer to handle things this way. They don’t like backing down or being hesitant when it comes to solving these problems. ESTJs are often aggressive people when it comes to accomplishing their goals, since they believe in always taking care of their responsibilities. They believe in efficiency and so they will certainly use facts and focus to get the job done. ISFJs often believe in facing problems head on, especially ones they know how to solve practically. They especially want to tend to the problems which might affect their loved ones or the harmony in their environment. For the ISFJ it is important to always be capable of taking care of the people around them, even when problems arise. They will do their best to be on top of things and not hide from these struggles. ESFJs prefer to face most problems head on, especially ones they can solve with practical means. They are focused and hardworking people who do whatever it takes to get the job done. They care about making their loved ones happy and want to always consider them. When the problem is tied to emotions ESFJs want to be a bit more delicate with them. They will face most issues head on, but there are times when heavy emotional struggles can be something they want to come at from different angles. ISTPs are capable of facing problems head on, but they don’t always want to. There are times when the ISTP wants to face their struggles in a less direct manner. They might even have times when they don’t want to face these problems at all, at least not at first. ISTPs like to explore their options and take things are their own speed. Feeling obligated to what others expect of them can sometimes cause the ISTP to rebel. They do enjoy problem solving but they do this on their own terms. ESTPs don’t really like feeling obligated to face their problems head on, since they want to go at their own pace. There are times when they want to procrastinate these problems, and leave them until they absolutely must tend to them. This is because ESTPs live in the present and want to be able to follow whatever path feels right for them. They enjoy going after the things which inspire them most, and sometimes this means avoiding certain problems for a little while. ISFPs don’t really like attacking their problems head on, since they often feel a need to retreat and be on their own. They live in the present moment and so sometimes they don’t really feel like dealing with these struggles with which bring them down. ISFPs are capable of handling their problems, they just don’t like facing them head on and in the way others expect them to. ISFPs would often rather follow their hearts and go whatever they feel more inspired. ESFPs often procrastinate their problems, not wanting to face them head on. They sometimes put these things off for a while, or until the very last minute. ESFPs can often handle these problems, they just don’t want to handle them right away. They prefer to do the things which inspire them in the moment and live their lives very much in the present. ESFPs follow their hearts and seek out things which bring them joy, which often means procrastinating the problems they need to face.